Read Chef Talk's review with a sample recipe for Everyday pancakes. This is my first go to for the basic recipes. Less comprehensive than Joy, but Bittman's recipes are better. A basic sauce that is easy to make and appropriate in many different applications. Besides a drizzle sauce, it can be used as a dipping sauce or a marinade. I like the soy sauce variation, but there are lots of flavor combinations to try. This is a handy recipe to have in one's repertoire. Several variations: spiced, herbed, fiery, sesame-soy, miso and juicy. Time to make: 5 mins. P22. P23. Time to make: 15 mins. Good as a dip or a garnish. Several variations suggested, including fruit, pureed, Chilean, Italian, avocado-red pepper, bean and cheese. A variation on the yogurt sauce recipe, this is not quite as good as a traditional buttermilk-based blue cheese dressing, but it will do and I am more likely to have the ingredients I need in the fridge. Replace half the yogurt with sour cream and go easy on the lemon juice. The standard bearer in my house-using walnuts instead of pine nuts since that deepens the flavor. Too thin & too mayonnaise-y. Next time I'm going to add some sour cream, and perhaps lemon juice, sea salt, and lots of fresh cracked pepper. Really strong mustard without any real addition of flavor from the beer. Simple and easy. To boost flavor, I added a bit of lime juice. Vinegar would also be welcome. Brush on chicken or fish before grilling. I made this with the addition of shallots and wasabi, and it was very flavourful. I would love to add a thai lime leaf to this next time. P80. Time to make: 15 minutes. This is a useful recipe for jazzing up plain nuts. Watch carefully as they can get too brown quickly. There is a variation for sauteed, one for spiced, and a no-fat one. A variation is given for seeds, but the 30-minute cooking time is too long for that one. Set this out as a meze item for a party. I was surprised by how quickly it disappeared. This keeps well in the fridge for quite a while. A very good dip for crudites. There are several variations, and I usually have the ingredients on-hand. Also can be used for a salad dressing. This is an easy recipe that can quickly be varied just by changing up the sauce. For the Super Bowl, I made three different versions--all got eaten. p115. Even though I only gave this three stars, it's actually a pretty good base for a butternut soup. I found it to be quite thin when made as written, however, so I would either double the amount of squash or decrease the broth by at least two cups. Adding some additional vegetables, like red peppers, would also help round out the flavor. A good use for leftover cooked pasta. As with many bittman recipes, the end result is better if you incorporate as many variations as you can. A variation of noodle soup. P129. Time to make: 20 minutes, more or less; suitable for weeknight cooking. This can be made with leftover cooked chicken or rice. It is a very adaptable recipe, with 4 variations plus 9 suggested additions. I made the Chinese-style variation, substituting bok choy for peas. The other variations are: with Vegetables; Mexican-style; and Chipotle. I reduced the amount of broth from 6 cups to 4; it served 2 with leftovers. The soup does need a little flavor boost, as it tastes somewhat bland. Recipe as written doesn't have a lot of flavor. Use as many of the suggested 9 simple additions as possible to build flavor and you will have a really good soup. This is a variation of Chicken Soup. Good, but a little lacking in flavor. Variation on the Tomato Soup recipe. This is a good soup, although it is a little like eating tomato sauce (particularly reheated--too thick). I liked adding some black garlic, which had the same sweet garlicky flavor as roasted garlic would. This chowder was easy to make. The recipe requires 3 ears for 1/2 recipe but I had only 2 ears but still chowder had good corn flavor. I needed 2 cups half and half, which I did not have, so added non-fat milk to the 3/4 cup of heavy cream which I did have. Preparation is simple. Cut the kernels off the cobs and then cook the cobs in water to make a corn broth and then discard the cobs. After sauteing chopped scallions and a little sugar in butter and then adding flour to make a roux, add the kernels, diced potato, cream and corn broth to the mixture and simmer for about 15 minutes. That's it. I did add a small pinch of cayenne to the salt and pepper. Added a bay leaf to the corn cob broth. I would not use the sugar again because the corn didn't need it and made chowder too sweet. Also I would prefer a lighter chowder, my preference, so would use milk rather than cream. I made a pot of this today (for the week) taking mjes’s suggestion to use Thai broken rice. I used 3/4 Thai broken rice and 1/4 brown sticky rice. I flavored with reconstituted (from dried) lobster mushrooms and Chinese sausage. My preliminary tastes indicate it’s a winner. Can’t wait for my breakfasts this week! I spent nearly 50 years trying to duplicate the texture of Sam Wo's jook. The number of older Chinese diners was evidence that it wasn't just me - Sam Wo's jook was special. Ignore Mark Bittman's choice of rice and get yourself a bag of broken rice from a Thai grocer. That makes this a heavenly recipe. Simple, tasty. Satisfied husband's request for "soup with meat in it". Wouldn't change anything. These are good, basic instructions for a croque monsieur. I used hefezopf bread, which worked well. Surprisingly, the kids weren't into the ham. Maybe they'd like it better if I use prosciutto instead. These sandwiches are filling and good for a casual family supper. If you've no time to roast the peppers, just let them sautee in the pan with the onions. Some sliced cheddar is also a nice addition. A nice way to use up leftover greens. A variation of potato salad with vinaigrette on p189. A very loose, free-form recipe with several suggested additions. Great base for a wide variety of vinaigrettes. Good recipe for coleslaw. I like the mustardy vinaigrette. A few variations are given. This is a variation of spicy no-mayo coleslaw on p206. This salad, simply dressed with lime juice, had great colour texture and flavour, even made with defrosted corn niblets. Will definitely be repeated, especially once corn is in season. Nice salad--almost a salsa--that goes well with grilled foods. Great color and super easy to make for a weekday dinner. Delicious, I used yellow carrots and yellow beets. The ginger was a great idea. I did not have fresh cilantro so I used a combination of fresh parsley and dried cilantro powder. So good I am making more tomorrow to bring to friends. Used taragon mustard. Peaches & tomatoes go great together. A little balsamic vinaigrette, salt & pepper is all you need, or nothing -- just the juicy fruit. Or add some dried bread cubes to start making a panzanella. But only in the summer, when it's all ripe. P222. This is a variation of Fattoush. This is a variation of Chicken Salad with Olive Oil. This is a good quick method with cucumbers; also tried with zucchini. The vegetables keep ok for about 1 day. I like mixing up the vinegars and adding a little flavor, via soy sauce for instance. Two variations are given: Mexican-style and mango/papaya, but many other vegetables to use are suggested in the headnote. Time to make: <1 hour. P229. Thin with cream or stock for a sauce. Page 245. The result are fried vegetables similar to apps on many restaurant menus. Eggplant and zucchini seem the tastiest options. This is shallow frying, not deep frying, but still requires a lot of setup, some salting and chilling time, and then preferably eat as soon as they are fried. This might be a good project for a late Sunday afternoon. How-to for grilling various vegetables. Useful. There is a chart listing different vegetables with grilling instructions and serving suggestions. Grilled vegetables keep well. Time to make: 30 minutes or so. P249. P258. Probably my favorite way to eat asparagus. I prefer roasting or grilling. Takes less than 30 minutes to make, and leftovers keep well. 10 serving suggestions are given for variety. Add a fried egg on top for a quick lunch. Really yummy - the butter & caramelised beets are wonderful. Cooked for 6 minutes before turning, and it didn't hold together well - will cook for 8 minutes next time. The greens got a nice char and the oyster sauce complimented them well. It took a lot longer and a lot more water to get the stalks to be anywhere close to tender (and I should've let them cook longer). This is very salty from the soy sauce. The cooking method intensifies the bitterness of the greens. Additionally, if you make this per the recipe, you'll end up with cold greens. Broccoli and blue cheese are a great combination, and this is a perfect way to prepare them together with minimal fuss. My six-year-old loved it. I find there is no need to remove the garlic cloves; if you leave them in for the entire roasting time, they will be reasonably soft and mellow and can be eaten together with the broccoli. Next time, I would finish it under the broiler to better toast the breadcrumbs prior to serving. Simple to prepare and tasty. This is a good side dish to prepare alongside a rich main course. Hazelnuts pair very well with the sprouts. Because I needed to use the oven for other purposes, I just sautéed these on the stove, which worked out very well. Unfortunately, I let them sit a couple minutes too long in the hot oil before tossing them, so they were quite charred. Fortunately, they still tasted great - there's just something about burnt brussels sprouts, I guess. They only needed about 20 minutes total cooking time this way. The flavor here is great, and it comes with minimal effort and ingredients. I think I prefer my cabbage a little more well-cooked, however, so would allow for up to about 20 minutes of cooking time rather than just 10. Great cold weather meal! I made the variation with kielbasa, but still added some onion. I also threw in a little caraway seed. Next time I might try adding some peeled, diced apple to the braise. Very easy and tasty. I like the variation with the walnuts and a little brown sugar added. This was tasty and easy. I was surprised my picky preschooler didn't like it more. Had it without the almonds and it was delicious. Will try it again and add the almonds. Roasted cauliflower is always good, and this is an easy way to dress it up a little. I didn't have already roasted peppers, so just added diced red pepper to the pan in the beginning with the cauliflower. I added the pine nuts about three minutes prior to removing everything from the oven to further simplify the dish. Be sure to let the cauliflower blacken and crisp up on the edges for the best flavor. Sprayed 9 in square pyrex with cooking spray. Full recipe of bechamel sauce but forgot to double the cheese. Used soy milk and soy cheese to make it dairy free. I did not cook these for a whole hour. I think the cooking time can be varied depending on how much time you have. The tomato broth flavor still infused the green beans even at the shorter cooking time. This recipe is fine but I think I prefer the Joy of Cooking's recipe for sauteed kale with garlic. p308. A fast & easy side dish. I soaked the fermented beans in a bit of water for 20 minutes then mashed them with a pestle before adding. I skipped the soy sauce because the beans were salty enough. We subbed peanut butter for the tahini, and the cook who shall remain nameless added a little too much salt, but overall it was better than we expected. Simple to make. We made it with bok choy. J didn't care for it. Too mild. He thought it needed fish sauce for more depth. Needs more time in the oven. These were OK, and it's an interesting cooking technique I haven't used before with potatoes. I used a winter ale, and in retrospect, I think a pilsner or other relatively light beer would have been better. Although the winter ale wasn't especially strong, the beer flavor is very prominent here, and it was a little too bitter, especially paired with the horseradish. I could see this being good if the beer flavor was more mellow and let the cheese shine a little more. Absolutely delicious. I cut the potatoes very thin with my mandoline, and they basically melted into the cream and cheese. This would make a great side for a holiday dinner. Time to make: 1 hour. 3 simple variations are given, and other vegetables that can be added are suggested in the headnote. Leftovers reheat well. P346. This method really brings out the subtle artichoke flavor of the sunchokes, but the best part are the crunchy, caramelized bits that need to be gently pried from the pan. It's a delicious and somewhat uncommon vegetable side dish that would pair well with almost anything. Made 4-5-2016. I used a slow cooker & soaked over night. It took about 12 hours to cook. Added milk powder (~1/2 cup) and ~2 Tbsp butter to liquid. Added salt about 10-11 hours in. May just want to try the quick-soak way. Beans turned out creamy & good. As Bittman notes, despite being vegetarian, these beans are still full of flavor. Because of the molasses, they are quite sweet, but many people enjoy that aspect of baked beans. I had cooked my beans more fully than intended before baking them with the remaining ingredients, but that proved to be no problem. Although my pan was very full, I added a little boiling water as interacted, but I'm not sure that was necessary. With the addition of canned tomatoes and their juices, the beans were already quite saucy, and I ended up cooking off some of the extra liquid on the stovetop after removing the beans from the oven. I always make this with black beans and I use canola oil, not lard. They're completely wonderful. Now that I am a semi-pro at cooking dried beans in my slow cooker and keep cooked beans in my freezer, there is no excuse for buying canned refried beans. Since I cook for two, I made half the recipe. Bittman lists several fats to use for frying the beans. I used half leftover bacon fat and half corn oil but next time will only use corn oil. I drained the beans and reserved the liquid as directed but did not need to use it. Half recipe lists 1/8 tesp cayenne but I decided to sub ground chipotle pepper because I wanted the smokiness of the chipotle. I added a minced garlic clove with the 1/2 cup chopped onion but next time will use 2 cloves. Also I will up the amount of ground cumin. All in all, the recipe is very easy, fast and tasty. If you use the variation with bacon, it's extremely tasty. Also, be sure you don't use hot chili powder unless you want it to be REALLY spicy. This recipe is good alone, but it's better mixed with mashed potatoes or rice. This was just OK. I love sauteed cabbage, so I sauteed it along with the onion and celery rather than boiling it. If I made this again, I'd cut back on the pasta & increase the cabbage. I tried this recipe with both with the cream and sour cream. It was a bit soupy with the cream, and very rich with sour cream. I suggest using half of each for the perfect balance. Flavorful, delicious alongside "Chinese Broccoli in Sesame-Sichuan Vinaigrette" from Vegetables from Amaranth to Zucchini. Always seem to make this when I have leftover rice. Yummy and very adaptable. I just throw whatever other leftovers I have in and it works well. This is a bood basic recipe that can serve as a blank palette for whatever you want to serve with it. I like topping it with a mixture of sauteed mushrooms and bacon. Time to make: 45 minutes. 5 variations given: milanese, herbs or pesto, lemon, cheese and seafood, and the following recipe contains even more suggestions for varying the recipe. P466. Delicious! My father thought it rivaled any restaurant risotto he had ever had. Only change I made was to substitute baby bella mushrooms for the shiitake. Perhaps not authentic but a tasty one-pan rice dish nevertheless. Baking it in the oven was new to me and worked well and I appreciated the directions for achieving the bottom crust. I changed the protein proportion a little based on family favourites (6 drumsticks, 227g chorizo, 300g shrimp) and added the shrimp 10 minutes into the cooking time. Serves 6-8. Combined this with the sauted leeks, and chopped fresh thyme. Excellent. Served with steamed fresh zucchini and grilled tenderloins. Large surface area and med-high heat transform an onion and a can of tomatoes into this delicious, fresh tasting tomato sauce in 20 minutes. P502. This is an all-purpose tomato sauce for pasta, pizza, sandwiches and baked dishes. Quick to make, and if you make an extra large batch, leftovers are easily frozen. 20 simple variations are given. A very useful recipe. The recipe was fine but not great. I would like to find a better one. Made 1/2013. This is the best way to make mac, in my opinion. P516. Made many times, usually with the sausage variation. Good with broccoli or greens. Bittman suggests 13 ways to vary it, making this a very adaptable weeknight recipe. Time to make: 40 minutes. Leftovers don't keep. Variation of pasta with broccoli. I prefer making this version. I made it with peas, green beans, and shishito peppers from my garden. It was good and easy — a great way to use up extra veggies. I topped it with grilled shrimp. Yum! This was a surprise hit. It required the attention of a risotto but cooked in a fraction of the time. I used ditalini and everyone loved the way the cheesy sauce filled each little tube. I omitted the butter and used only 1.5 cups pasta for 4 people. Easy enough to sub other veg for the mushrooms. I used cauliflower. Everyone liked. Can also add cooked meat to make the dish more hearty. p535. This was easy to prepare, but bland. Needed some salt (which I never do, and omitted from original sauce preparation.) It makes alot. I even amped it up sauce with a bunch of herbs and garlic. Rave reviews from family for this easy dish. It makes a lot. I would only prepare for dinner parties and potlucks. But with three cheeses, it's sure to be a crowd pleaser. Instead of making the quick sauce from the recipe, I substituted homemade marinara, which ups the flavor profile I lot. A delicious way to overcome winter squash fatigue. Made with butternut squash, the dough was very wet as warned and seemed to have an infinite capacity for flour; I stopped adding it when the dough was still sticky but firm enough that I could roll it. They seemed a tad dense and flavourless just out of the water but once they were browned in olive oil they were wonderfully crisp with a tender centre and the sweet flavour of squash came through nicely. 1. Spätzle is German, not French. 2. It's pronounced "Schpets-leh" not spay-tzul. Good, simple, and easy udon noodle dish. The flavour combination is very similar to Dashi Dipping Sauce. We loved this! So easy and lots of flavor. This is great, fast, and easy. I wouldn't say this was the best, but it certainly was simple and very tasty. Very simple marinade, just lime juice and soy sauce. Could use more pizzazz. There is a misprint in the name of the recipe--it should be herb-rubbed. This is a great treatment for any fish--very fresh and flavorful. Use garlic chives if possible. Wasabi paste works instead of powder, add with the soy sauce. I used mussels. I enjoyed this much more than the tuna marinated with soy and lime. The chicken seemed to absorb the flavors better. Perhaps it was the addition of sesame oil. This an easy, simple recipe that should be a staple. Pg. 645. This is a sub-recipe under the 'Simplest Whole Roast Chicken, Six Ways.' I find his technique with these recipes to be a great way to roast chicken. There is so much less mess than when using a roasting pan. These are extremely simple recipes. I added rosemary sprigs to the interior of the chicken. It turned out very, very well. They described this as spicy--so I was a little wary because I don't really like spicy food. However, I do like garlic and ginger--so I doubled the amount of those two. But then I was afraid to use a whole teaspoon of coriander--so I just put in about 3/4 teaspoon of it, but I needn't have worried. The end result wasn't anything that I would refer to as spicy. Did smell nice though, thanks to the coriander. Maybe I didn't really use enough salt and pepper either. This would never be mistaken for fried chicken but it's not a bad way to add flavour and texture to boneless, skinless chicken breasts. I turned them half way through baking since the oiled baking sheet seem to play a role in browning the panko and keeping it crisp. Baking time was 20 minutes. I always forget that broiling chicken dirties my oven and sets off the smoke detector. This is a better recipe for grilling, but for that, it works very well. There are many variations beyond provencal. I like the Asian-influenced soy marinade the best. The ingredients didn't add much flavour to the chicken meat itself but did make a fresh and bright sauce for drizzling at the end. This is a good method for preparing herb-flavored boneless chicken breasts for use in sandwiches or tacos. However, it does take a lot longer than the sauteed method, which is necessary so the herbs don't burn. Experiment with different spice combinations to vary the flavor. I prefer using fresh or cherry tomatoes to canned for this recipe. I don't think the egg whites are necessary. The coating adhered to the chicken fine without them. This was tasty and easy for a weeknight. Blah.....I did add some other veggies, and sauced it up with some chicken broth as an option. This was boring and bland. I'll stick to some of my other recipes for chicken/veggie stir fry next time. Also, to make it worse, I served over Korean rice noodles which were gummy and also very bland. Total disappointment. Extremely simple - was able to show my husband how he can cook a batch of simple poached chicken on the weekend. Then we can make many varieties of salads and lunches for the week. Having just cleaned my oven, this method of stove-top cooking held great appeal. The skin wasn't edible (nicely browned but not crisp) but the duck meat was tender and flavourful and the recipe yielded some duck fat for future cooking projects. I omitted the apples and calvados. Skipped the carrots, added tabasco sauce, used fresh breadcrumbs. 50 min. at 350 degrees, then 3 minutes under the broiler. This was good, easy, tasty. Veggies didn't need as quite as long as recipe called for, grill at 400 deg. - they really needed about 10-12 min max. to be a bit al dente. I used zucchini, baby creminis and red bell pepper. Also used sirloin filet (didn't have tenderloin) which at 5 minutes was perfect. Bumped up marinade with a little more olive oil to stretch, 1/2 lemon, soy, fresh thyme and fresh parsley. The lemon gave a nice contrast. Marinade coated 1 lb sirloin cubes, 1.5 zucchini (med size) 8 mushrooms and 1/2 med. red bell. Served over rice. Good adaptable recipe. I liked the marinade but would have liked the flavors to be a tad stronger. Used on steak and tuna plus assortment of summer vegetables. Quick, easy, very tasty. Nice weeknight meal. p 755 1-24 hr marinade, 3 hours cooking. Flavour was good but a 2kg bone-in pork shoulder wasn't anywhere near done in the cooking time given. I'm sure opening the oven door every 30 minutes to turn and baste it, lowering the temperature each time, didn't help. I left it alone and cooked it for an additional hour. It was moist but not fall-off-the-bone tender. The recipe didn't specify if roast was boneless or bone-in. Good, but nothing exceptional. I served the shredded pork over mashed potatoes, and if I make it again, I'll reduce the cooking liquid down for a sauce. So simple but succulent and perfect. The anchovy adds umami and savoriness without an overpowering fishiness. Said to be the national dish of Poland, I first had it in Australia. Tried this for someone whose late mother made it. No idea how authentic this version is, but it was tasty in mid-winter. Based on other recipes & whim, I improvised freely. Substituted smoked turkey thigh for bacon, used turkey sausage, just 1 pound beef plus 1/2 pound pork. Skipped the caraway, swapped sweet wine with dry red, added bay leaves & 2 tart chopped apples. Doubled the onion & the cooking time. Might make it again some chilly day. p799. This is a good method for cooking eggs, along with some suggestions on how to incorporate leftovers. A useful recipe for a light supper or brunch. Takes less than 30 minutes to cook. One variation is given, although the following recipe could also be considered a variation: with tomato, with spinach and with onions and cheese. This recipe is easy and works perfectly. The recipe is for two people, but the next time, I'd plan to halve it or use the recipe as is for four. The quantities are quite generous. I also simmered, then cut and fried some Olympic Provisions chorizo and put it in the oven in the dish with the Huevos Rancheros to reheat. One sausage is plenty for two people. Try substituting bacon or sausage for beans. Variation of the basic frittata recipe. These are probably my favorite waffles to make. Light yet substantial, with the overnight rise of the yeasted batter giving the dish a nice complexity. If you plan ahead, they are very easy to make, too, and you can easily add the eggs to the batter and have it ready to go in the time it takes the waffle iron to heat. I use a Belgian style iron. It takes less than ten minutes to mix this bread together and pop it in the oven. Of course, the hour long baking time means you still need to prepare it well before you plan to eat it. The loaf is tender and lightly sweet, and excellent topped with a smear of butter. Unfortunately, it wasn't a favorite of my five-year-old's (although he still ate it), but the adults enjoyed it. Added 1 cup coconut rather than 1/2 c coconut / 1/2 nuts. Cooked in 2 smaller loaf pans. Delicious. This bread would have been quite good had my yeast worked. I didn't have instant yeast, so I dissolved it in water, and it appeared as though the yeast was starting to bubble (plus, I'd just used this yeast successfully two days earlier to make pita). When I returned home in the evening, the dough was still a solid lump, but I decided to finish it anyway. The flavor of the bread is delicious, nutty and lightly sweet. Even as a dense loaf, it made decent toast, somewhat reminiscent of the dense, whole meal breads of northern Europe (although that style of bread is much better when made from a recipe intended to yield dense results). I would make it again, just with better yeast. The feta and dill filling is quite tasty, although my six-year-old did not agree (the one-year-old, on the other hand, was happy to eat it). My pitas puffed up significantly in the oven. but were soft and tender. I baked them on a baking steel, and found that they baked best at 450, not 350 as noted in the recipe. Even at 450, they needed 10-15 minutes to really bake thoroughly and get a nice golden crust. For the filling, I used only two eggs but kept the other amounts the same. This kept it from being too eggy for my husband, who dislikes the taste of eggs, and I didn't find this caused any issues. While it doesn't compare to the amazing naan we find at some of our local farmer's markets, this was quite good for being cooked in a home oven. I used my baking steel to great advantage here. If you want fresh baked naan for dinner, just make the dough in the morning, put it in the fridge, then take it out in the evening to rest on the counter a little before you bake it. I found that I had to add an extra quarter cup of flour, however, and the dough was still quite wet. But wet dough tends to make bread with great chew, and these were incredibly quick to roll out when first dusted lightly when flour. Finally, I mixed chopped raw garlic in with the melted butter for a garlic naan topping. This method doesn't get as evenly brown and crispy as I'd like. I prefer a method of drying croutons out in the oven. These spread. More batches, smaller cookies, bake a little longer than directed, about 12 minutes. I didn't find these to be cakey at all, even with the two eggs. Instead, they were fudgy and delectable. I cooked them at the low end of the recommended baking time (just twenty minutes)- they didn't look quite done in the middle but the residual heat finished the baking process. I added less sugar (350g) and some dried cherries. Cooking time 30 min. Very fudgy. These are good -- I mean, they are cookies, how bad could they be? but not very exciting. I think I prefer cookies that have more oats and less flour. Do not use convection bake for these. Too sweet, not enough lemon flavor and tang. Made for FIL's birthday. He loved it. Very simple. Not as thick or rich as a ganache but still a decent topping with good chocolate flavour - especially made with bittersweet chocolate - suitable for a variety of desserts. For serious dark chocolate lovers! This is extremely rich and intensely chocolaty; you absolutely cannot detect the tofu! I served it with sweetened whipped cream that had a dash of Grand Marnier. This was great, but I told my kids what was in it before they finished. Spoons down, and they walked away! Great recipe, very adaptable, and a nice alternative to ice cream, especially when fruit is in season. I made this with peaches and added some half-and-half using the ice milk variation to create a light and delicious "peaches and cream" dessert. Also makes a good topping for bruschetta. Leftovers keep well. Disappointing. It baked up crisp but apart from being very salty, had little flavour and was quite dry. The variation works better, I think--parboiling first. Leftovers are good with eggs or in a salad. This dish has a really nice flavor, garlicky with a sweet undertone from the black vinegar. It can easily be prepared in under half and hour, and is a fine compliment to meat based stir fries. Slow, but good results, and frees up the stovetop for other uses. This is a variation of the fast tomato sauce recipe. Despite the generous amounts of garlic and ginger, this dish was lacking in flavour. I was reading a culinary mystery in which the sleuth is fed hot milk toast after a traumatic experience. I don't recall having it since my early teens so I got a "hankering" for it as a late night snack. A bread that toasts well, a good cultured butter, warm whole milk, and some fresh ground black pepper. Does life get any better? Is there anything much simpler to add to grandchildren's cooking repertoire? Not really a recipe, just guidelines for putting together main course salads. ...the comprehensive yet handsome manual to wrap up for a young person in your life who just needs a place to start in their journey of feeding themselves well. The pasta tastes rich and decadent with salty prosciutto flavor and soft, fragrant garlic. Believe me - your kitchen will smell insanely good while you're making this pasta! Hailed as "a more hip Joy of Cooking" (the Washington Post) and "a tour de force" (Jacques Pepin) when it was first published a decade ago How to Cook Everything won both James Beard and IACP Awards--and quickly established itself as an indispensable kitchen companion for a new generation of home cooks, with sales to date of 2 million copies. 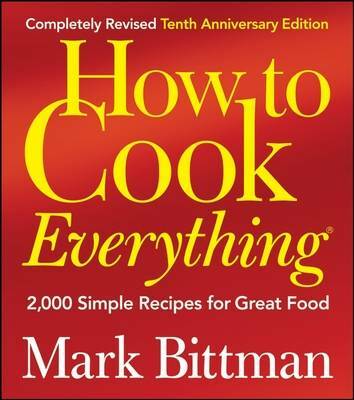 Now, on the tenth anniversary of its original publication, Bittman has totally revitalized this cookbook classic to make it even more appealing and useful for today's cooks, updating recipes and information, adding new dishes, expanding chapters, and incorporating many new features. With great new content plus an eye-catching look, How to Cook Everything is now more essential than ever--and a surefire bestseller.